There was a time when I thought my kitchen was pretty cute. There was a day when the paint was fresh and the shelves were lined with pretty, bright shelf liners. That day was quite a while ago. Today, my cabinets look like they’ve seen better days…but since I lack time or funds to totally remodel my kitchen, I’ve wanted to find a way to refresh my kitchen so that I don’t cringe every time I open the cabinet doors. Let me start off with a couple of before pictures. I decided to focus on three different areas in my kitchen to refresh and organize: the cupboards with cups and plates, the silverware drawer, and the bread cart/cutting board island thing. The problem: the cupboards haven’t been cleaned in ages. The kids typically put dishes away, but since we use almost everything in the cupboard daily, there wasn’t too much organization that was needed. I removed everything from the cupboards and cleaned the shelves with a wet rag. 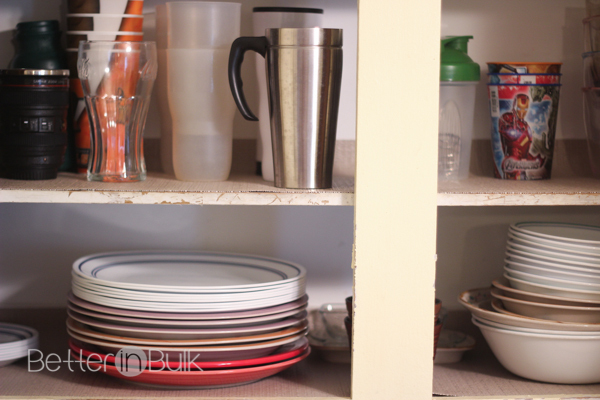 When was the last time that you wiped your cabinet shelves clean? I admit I don’t do it often (read: pretty much never). It felt so good to clean up the shelves. 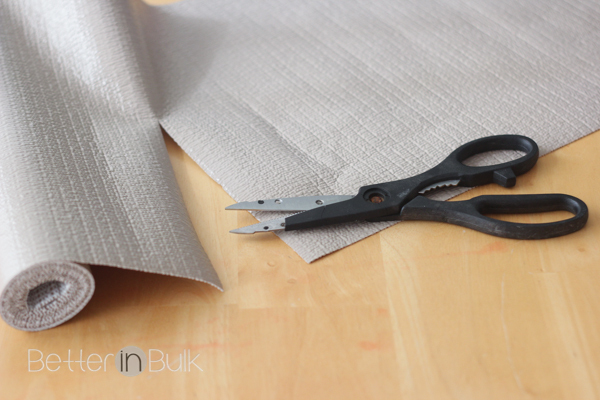 I then measured the length of the cupboard shelves and cut a length of Duck Brand’s Shelf Liner to fit. 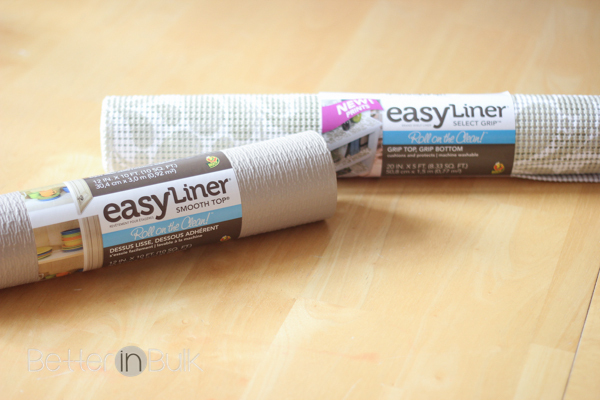 I chose the Smooth Top Easy Liner because it has a nice grip surface on the bottom but it’s smooth on top and easy to remove cups, plates, and bowls. The problem: the silverware drawer seems to be a junk-collector. There were a bunch of plastic spoons, knives, and forks that really didn’t need to be there, old hand mixer beaters for a hand mixer that has bitten the dust. Just like the cupboards, I emptied everything out and wiped down the drawer and cleaned the silverware organizer. I lined the drawer with Select Grip Easy Liner, which has a grip surface on the top and the bottom. 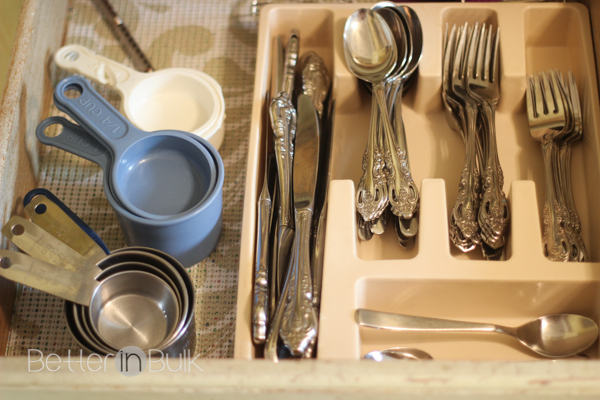 The grip surface is great for keeping the cups and other non-silverware accessories in place. 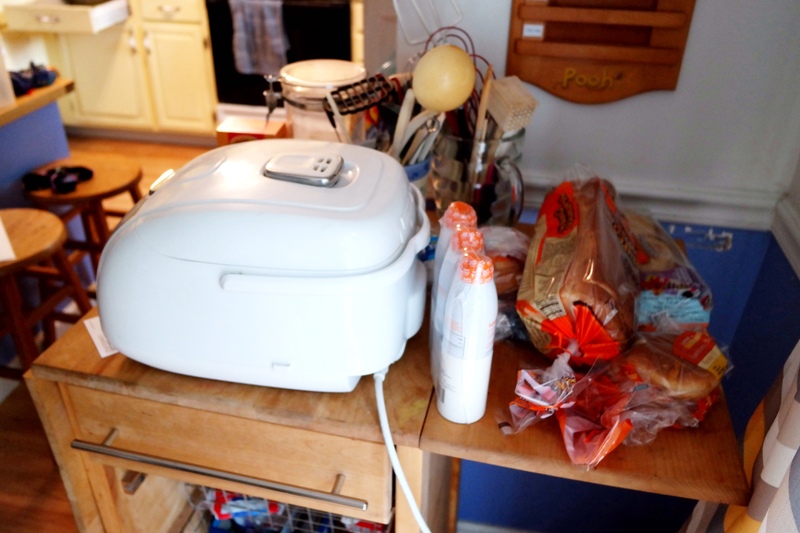 The problem: I love my little island-bread cart thing (I really have no idea what to call it, but I use it to store all of my bread, lunch snacks, rice, and rice cooker, plus two containers full of kitchen utensils that don’t fit in my smaller container next to the stove). But the open wire drawers tend to be a mess and the top tends to be a catch-all for bread, coupons, chip bags, and a bunch of other random things. I removed everything from the top of the cart, wiped it clean, and then cut a length of Select Grip Easy Liner to go on the top of the shelf. I cleared the bottom drawer and put all of the bread nicely hidden away. Then I only put back what I wanted to see (and what looked nice!). I am in love with how it turned out! Did you know? 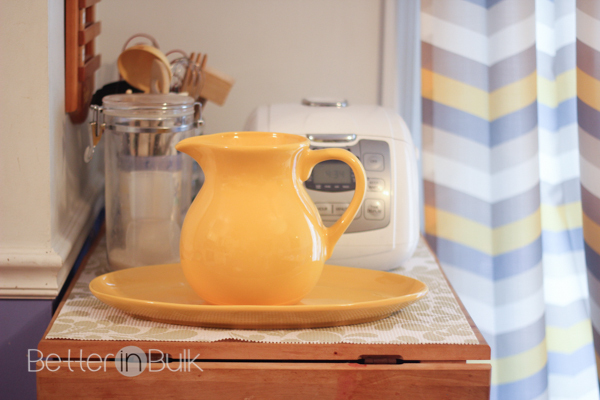 Duck® brand adhesive and non-adhesive shelf liners are an easy – and beautiful – way to organize and refresh your kitchen and other areas in your house. Follow Duck® brand on Pinterest and Facebook for tons of creative inspiration! 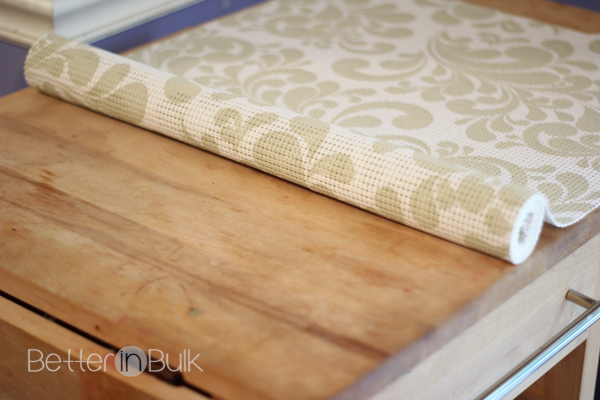 What projects do you need to do at home that Duck Brand’s Shelf Liner would be perfect for? Ya, I cant remember the last time I have wipe my cupboard shelves clean. Yikes! You did a great job and it looks awesome. I will have to try that liner out. I need to do this. The liner in my cupboards does not even stick anymore. Ewwww and I need to take the dishes out and wipe down the shelves.